I returned last week from a trip to Egypt, Turkey and the Greek Isles. It did not occur to me until I was flying home that I indeed had experienced a “Kairos” event, preceded by a Kairos moment when on a whim I asked my son, Barry, what in the world he wanted to see in this lifetime and if he could go anywhere where would it be? He immediately answered, “The Pyramids.” The fact that he is single once more and I could take the time off from my practice was nothing short of a miracle. Also, our ability to pull the money together for an extraordinary trip was in itself miraculous. We did not book until quite late with only a few cabins left on the ship as my son‘s passport had been stolen and we could not book until his new one arrived. But alas, it came and we obtained a choice cabin with a wonderful view from our large window looking out to the sea. We had not taken a trip together since he was a teenager but somehow all the stars aligned to create a vacation together as mother and son. We flew to Istanbul staying a few days in town seeing the sites, the Blue Mosque, Sophia Hagia, the Grand Bazaar and recuperating from jet lag in our luxurious hotel, before boarding the Norwegian Jade for a 12 day cruise. My son had not been to this part of the world and I had been to all but lovely Mykonos which we both truly loved. Santorini, Mykonos and Napflion on the mainland of Greece were our favorites as was Istanbul and of course Cairo with its mystical Pyramids. 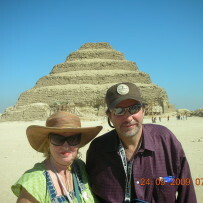 We left the ship in Alexandria and traveled to Cairo, staying at the Mena House close to the Giza Plateau where we could almost touch the stone. The experience was fantastic and we were blessed with a wonderful guide for our tour of Egypt. He was associated with the North Africa Tour Company and was without a doubt the best informed, charming guide I have ever had anywhere in the world. I salute you Hamy! I learned more from him in a few days than my entire previous tour of Egypt some years ago. It was indeed an “opportune” time. The trip itself was true Kairos. “The two meanings of the word apparently come from two different sources. In archery, it refers to an opening, or “opportunity” or, more precisely, a long tunnel-like aperture through which the archer’s arrow has to pass. Successful passage of Kairos requires, therefore, that the archer’s arrow be fired not only accurately but with enough power for it to penetrate. The second meaning of Kairos traces to the art of weaving. There it is “the critical time” when the weaver must draw the yarn through a gap that momentarily opens in the warp of the cloth being woven. Putting the two meanings together, one might understand Kairos to refer to a passing instant when an opening appears which must be driven through with force if success is to be achieved.” White, Eric Charles, Kaironomia: On The Will-To-Invent, Ithaca: Cornell UP, 1987. The lesson is to choose the moment of Kairos or as John Keating told his students to listen to those who had gone before them” . . . Carpe, carpe diem, seize the day boys, make your lives extraordinary.” Dead Poets Society, Peter Weir, Director: Tom Schulman, Writer: Film, 1989. As we examine our own lives we can in hindsight see the moments of Kairos. Maybe we fired the arrow accurately but without enough force and could not penetrate the goal. Or the hole in the warp in the cloth was not large enough and we missed the entire moment unable to weave our dreams into reality. While we cannot go back in time and change the event or what we chose, we can see the significance and meaning of the event in present time whereas at the past moment in time, it was only a choice. If we recognize the moment and we choose to act upon it, this is a Kairotic moment or interchangeably a Kairic moment. I feel inspired that both my son and I acted upon our Kairotic moment and eperienced a wonderful trip guided by divine timing.